Tiffany blue–the colour of the box–was created solely for Tiffany by Pantone, and is not in their swatch books. 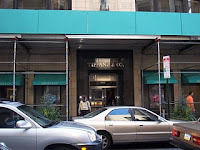 Turns out that even Tiffany can't get their blue uniformly right, as blogger Annie Elliott of Bossy Colour noted of the signage at the Philadelphia store: "This is teal. It is cheap. It is tacky. It has too much yellow in it. It is too dark." I'm looking for the original robin's egg hue in clothing or accessories. If green, it would be a tender leaf, if pink, a glass of rosé, if yellow, the lemon longing for your squeeze. But this blue! A sunny-morning spring sky. A woman visiting friends' last week wore a robin's egg pashmina, longsleeved white tee, jeans, and light tan (Barbados trip). I admired the burst of lush colour in our bare, early spring. "It keeps the vacation going" she said. Tiffany ar e promoting the daylights out of it. You can wear 'their' hue as a turquoise and diamond pendant, $4,900. 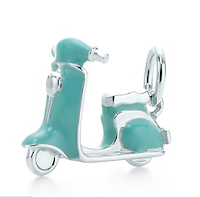 Too garish and jeune fille for me, but I find the enamel and silver scooter charm ($150) rather raffish. If I find a scarf or bag precisely this colour, I'll pounce. Oh, or driving loafers! In the meantime, someone has supplied their approximation of shade (Pantone 1837, the year the company was founded) as a colour chip here. My only doubt is caused by the fact that Pantone have decreed Turquoise as the Colour of the Year for 2010. A cousin of Turquoise, will the delicate robin's egg crack through overexposure? I'm with you about Tiffany's self-referential pieces. "If Found, Return to Tiffany's." Enough already! Love the scooter, though! Chanel also has a pendant out (black enamel, natch) of a young Coco astride a scooter. I'm finding that a VERY slightly more turquoise version of this color works wonders for my skin tone, and am also on the hunt. Oh,goody! I love turquoise. It is one of the rare colours that looks good on almost everybody.The Tiffany blue is even better for me. I can hardly wait to enrich my wardrobe! Thank you very much for mentioning bossy color's blog post about the disappearance of "Tiffany Blue." When you find the perfect blue, please let me know! Thanks again, and happy blogging. I love it that your blog and Privilege are both discussing color today. Yes, turquoise is one of those colors that I love. Over there I love it. On me, if it moves at all away from sky blue and into the green mists I am doomed. In fact, given the resurgence, I took an old pair of turquoise earrings out and tried them on. Nope. Gave them to my red-headed, absolutely fair-skinned daughter. She will look fabulous. How can anyone ever get over that little frisson of delight in just receiving a Tiffany box? How do you wear turquoise -- not the jewelry, but the color? It scares me a bit though I truly like robin's egg blue. BTW, I think the Duc sounds divine. Pseu: It screams 22 year old to me. Annie: Welcome, I enjoy your blog. Belle: Must be another sign of spring. hostess: I dislike any brand name on jewelry, but others are more tolerant. LPC: Yes, she will and what a generous gesture. It's good to know 'your' blues, seems like your palette is cooler. Tish: Since I wear a lot of black, and not much pattern, it is as an accent; I love black/white/turquoise. (So I would wear turquoise driving loafers with black pants and a white shirt.) Or in summer, turquoise and white, such as a turquoise cotton shirt with white pants, very fresh. There are more daring clothing combos such as turquoise with coral but as a tall, big woman that's too garish on me. Le Duc IS divine; I had to go through a few others to receive my great good luck. Funny -- I have a Birks box from way back, and it's very similar to that Tiffany shade -- wonder what their respective provenances are. I have to work in cycle chic somehow! The blue bicycle in the top picture is not precisely tiffany blue but it is a kind of robin's egg blue: http://www.copenhagencyclechic.com/2010/03/shots-i-like.html and very chic indeed. The blue on the Tiffany's shop is just ghastly and looks like a bus shelter more than a posh boutique. Turquoise... hmm. I do think of very lovely things - the semi-precious stone, Turkish ceramics and the fairytale mosques of the Silk Road, but alas like many people over 40 it also evokes 1980s visions of horror with particularly hideous bright turquoise garments winding up in remainders bins. Not really a colour for me, also because it detracts from my eyes, that are greenish blue, but I'm not (naturally) red-headed or fair-skinned. I love colour talk - harkens back to art school. Perhaps it is odd that many of us don't wear much colour, but I'm very fussy and often find the colours in the shops rather dreadful. lagatta: What a special bike! Thanks for link fix. materfamilias: According to Tiffany company history, their blue box was introduced during their first year, 1837, over 40 years b/f Birks' founding in 1879.
so the copy-catting is pretty obvious, then -- tacky! If you love the Tiffany Blue colour and want to surround yourself with it,then paint your walls in Benjamin Moore Bird's Egg. It's about the closest colour you will find to the box! What about on your nails? China Glaze has a Tiffany blue polish - it's called "For Audrey". I've been reading your blog for a while but this is my first time commenting - it just so happens I have been obsessing over this color lately as well! cK: Not so much I'd surround myself with it, but maybe for the inside of a cupboard, or one accent wall. jinnan-tonnyx: Perfect, the colour in a tiny bottle! Just saw a young woman today with a half-moon manicure, blue-black on the tips (actually on more than tips, maybe 1/3 of nail tip), natural on the rest. Could not take my eyes off it (very impeccably done). Not for me but- wow. It's interesting how a color could have so much to do with branding! I find Tiffany's multi-level marketing pretty funny. In this household, I receive the catalogs with the Return to Tiffany sterling silver jewelry, baby gifts, crystal candlesticks, and ceramic cache-pots. Meanwhile, my husband, who couldn't care less, receives the catalogs with the quarter million dollar pieces. Most notably, an octopus bracelet covered in micro-pavé multi-colored gemstones. Absolutely glorious and over-the-top, but not in my budget. Not in my husband's budget, either. No matter what Tiffany thinks.